Very cute and comfy Oruktam slippers from Snow Leopard Trust shop. These and more beautiful items makes lovely Christmas presents. This is so worthwhile…you get a lovely gift, either for yourself or to give a loved one, the people who made the item get financial support and the snow leopards that live in the remote mountains are supported by the villagers and the herding communities…talk about the old win/win! 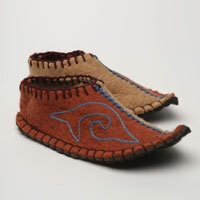 As for me, I’ve got my eye on these gorgeous Oruktan slippers – aren’t they cute? Check out the SLT Shop here.